Today we got a look at our first true glance of Supreme Leader Snoke in the flesh, not in his hologram state like we saw him in Star Wars: The Force Awakens. So let’s dive in and try and dissect what we see in the image and some of my personal predictions and opinions from what I see in the picture. 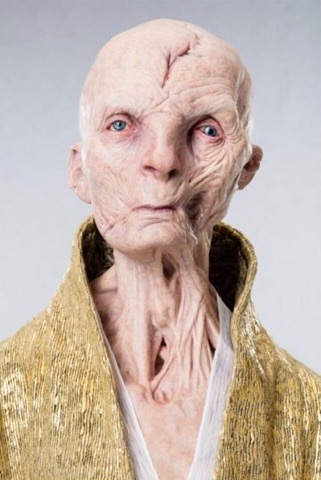 The first thing that came to my mind when I saw Snoke in the picture was, “dang this guy is ugly.” When you see him, you immediately assume that this guy is disfigured or deformed, but reports are theorizing that he may just actually be an humanoid alien and not a disfigured human. Personally I’m starting to lean more towards the alien side after seeing this photo, especially because of the throat and shoulders section. They seem to be longer and more pointed up compared to a humans, with his neck having holes that are exposed all of which point to an alien. The next thing that stuck out to me is that this guy seems pretty old. I’m not talking hundreds of years old, but maybe thousands or more years old. I’m going to assume that he was definitely around during the events of The Phantom Menace and way before that, living through Order 66 and the reign of Palpatine, maybe even the time of Darth Plagueis (if he’s canon). Personally I get this feeling that Maz Kanata and him have some type of past because to me they both seem to be relatively old and have been through all these decades of fighting between the Light and the Dark Side. I’m even willing to bet they meet at some point in either Episode 8 or 9, maybe even know each other. The last thing that stuck out to me was the clothes he is wearing. To me this screams out either fancy old Jedi style robes or the other option being someone of political power. Right now I’m currently torn between the two options, but my gut is saying it’s more of the old force user type robes. Now whether or not Snoke is an old Jedi or anything along those lines, I have no clue. I tend to believe that he isn’t a Sith or an old Jedi, but someone who is force sensitive, trained in the old Jedi and Sith ways, and just an overall knowledgeable person about the force itself. I don’t think he is an old character coming back at this point, but a new character in the universe with a quest for power. So what do you guys think? Does this confirm or blow up any previous theories you had about Supreme Leader Snoke? Is it still too early to make any assumptions about Snoke? Let us know in the comments below because we would love to hear your opinions.